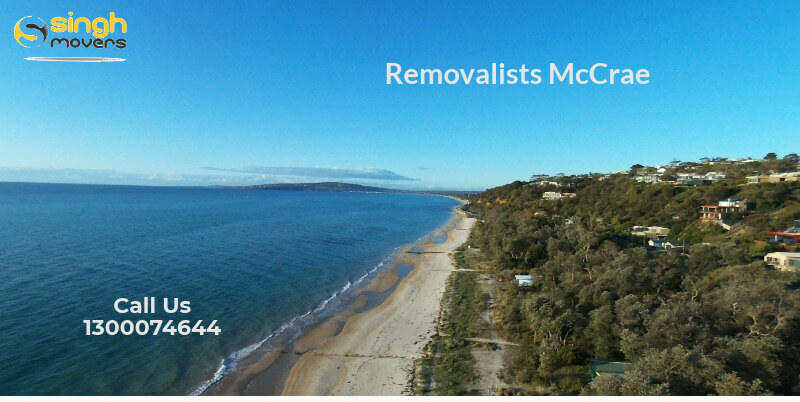 Are you looking for a quality Removalists Mccrae? Moving to a new suburb in Melbourne does not have to be complicated. But with the help of a Removalists Company, your move will be pretty easy. Our moving specialists can organize all aspects of your move. We will vindicate you with the best FURNITURE REMOVALISTS McCrae and they will do the work of everything from point A to point B. No matter how complex the packaging procedure is or transportation may seem difficult. Our Removalists Melbourne is dedicated to providing you with the quality Furniture Movers service to assist you at every step of the way. Singh Movers And Packers Melbourne removalists can help coordinate the services such as the packaging and unloading of the stuff and your other possessions. We will help you with the services of Furniture Removals from one place to your new desired location. We offer you with the clear communication processes in order to ensure you that you are always connected to the team. Our highly experienced packaging and moving experts will ensure your belongings are packed in an organized way and are ready for the move in the safest manner. Besides all this, we also provide the services of Office Moving, Furniture Removal and so on. We work 24x7 ensuring the satisfaction of our customers. We understand the worth of your belongings and thus we leave no stone unturned to ease you at this hectic work. The rates at which we work on our best tailored for your pockets. For any queries regarding this, you can call us anytime and we would be available for you. At Singh movers, we believe in the satisfaction of our clients. Our company doesn’t charge any extra amount from our clients in the name of fuel or anything. We also believe in providing 24x7 services to our customers. Thus, we work round the clock so that your work is at ease and not so hassled. We work wholeheartedly to serve our clients at a very nominal process. We don’t believe in charging any hefty amounts. We work with proper handling measures such as packaging sheets, cables, trolleys, heavy duty blankets and so on to ensure that your furniture doesn’t get damaged while the shift is being made. We provide swift and quick delivery. We also have storage facilities so that our clients can store their furniture if they require. So, If you have to go for the relocation of your office, home or any other place then you can surely rely on us and you will not regret. What All Does Singh Movers And Packers Furniture Removalists McCrae Services? · NO DEPOT TO DEPOT CHARGES: You will not be asked for any depot to depot charges as it is only our team who will reach you and why we will ask you to pay for that. · DOOR TO DOOR CHARGES ONLY: We will only charge you for the door to door shifting as that is when the main process starts. · NO FUEL CHARGES: Singh Movers will ever ask you to pay for any type of fuel charges as AFFORDABLE Interstate Removalists will offer you with every possible facility that we can and will not charge you for any type of extra stuff. · PROFESSIONAL TOOLS: Interstate Movers of Singh Movers And Packers Company treat their every customer as their family and complete their work with proper safety and using different types of professional tools. Singh Movers also have professional trolleys and ramps for the shifting of various types of upright pianos. · 24*7 SUPPORT: We will solve your every problem. You can call or mail us at any time you want to as we are available round the clock for our client’s assistance. WHY ARE WE THE MISSING PART OF YOUR FURNITURE MOVE? · CHEAP INTERSTATE REMOVALISTS: Along with the quality work, Singh Movers is very well believed because of their one major factor of services at affordable rates. We provide our customers with all the facilities at the minimum price possible. It is our company’s motto to endow their customers with all the services at low-cost so that the prices won’t lay heavy on any type of customer’s pocket. · ON-TIME SERVICE: Now this is a major doubt in every customer’s mind as many other service providers promise to shift the stuff on time but do not do so. But why Singh Movers? Because Singh Movers is fixed with their timings and do not disappoint their customers. Our timely delivery will always put a smile on your face. · SECURE TO MOVE YOUR BELONGINGS: Singh Movers can be fully trusted for the safety of the stuff as they plan, pack, and unpack the stuff using professional tools and by undertaking proper safety measures. Have faith on us and call us to hire for the Interstate Removalists Services. · CHECK OUR GOOGLE REVIEWS: This is a major important thing that customers always want to know whether the service of the company is good or not but our GOOGLE REVIEWS says it all as our customers have happily published reviews who were fully satisfied with our service. · QUALITY FURNITURE REMOVALISTS: We along with Interstate Removalists provide many other facilities like office relocation, moving interstate whether an office or a house, storage facilities etc. · RELIABLE FULLY INSURED MOVERS AND PACKERS: Singh Movers is a company of movers and packers at whom you can rely upon for all sort of work as we do all the work by ourselves itself once you hire us. You do not need to worry at any point of the shifting process. We are fully insured removalists in Melbourne. Though there never happens any sort of trouble if sometimes it happens for the goods in transit, we pay up to $100,000. On the other hand for any harm to the public, we pay for the public liability around $10,000,000. STORAGE FACILITIES: Services of SINGH MOVERS is widely open for every person in the whole of Australia at the reasonable prices so that each and every person with any type of status can hire us for the services. We remove and shift each and every material with the optimum ease by using our years of knowledge and experience. Singh Movers Australia are famous because of their more than 10 years of experience in this particular field and rendering the public with quality services. Our main motive is to serve the public with the passion of shifting we have in us. We do not work for the sake of money but surely work for the happiness of our clients. 100% customer satisfaction is our company’s main targeted aim. McCrae is a suburb of the city of Melbourne in Australia is located within the shire of Mornington peninsula local governmental area. McCrae recorded a population of 2,823 according to the 2016 census. Recently a new shopping center called McCrae Plaza opened and included a bill supermarket, which later became a colonel supermarket. The name of the area was named after the McCrere family which was the first European to settle this area. Mackrey Homestead is a national trust property that is open to the public. Lifting large and heavy stuff is not a one-man job and requires a professional fit team with years of experience. Allow us to do all the furniture removals work for you. Our quality FRIENDLY MOVING MEN will help remove furniture items along with providing you with the best services of moving furniture. We even endow you with the Interstate Removalists services at pocket-friendly prices. We are a professional Furniture Removalists company so after hiring us for the same you can have peace of mind and also our Furniture Removals team will ensure you with the peace of mind that you deserve. We are also ready in meeting and beating to the prices of any other movers and packers.